Use the controls in the Advanced pane to adjust additional distributed processing settings. These advanced controls are intended for network administrators and other users with networking experience. For more information about distributed processing, see Transcode batches with multiple computers. Enable additional Compressor instances: This checkbox activates additional instances of the Compressor application, which can potentially speed transcoding. After selecting the checkbox, you can choose the number of additional instances from the pop-up menu. For more information, see Create additional instances of Compressor. Note: If your system doesn’t have enough memory or processor cores, this option is dimmed and not available. 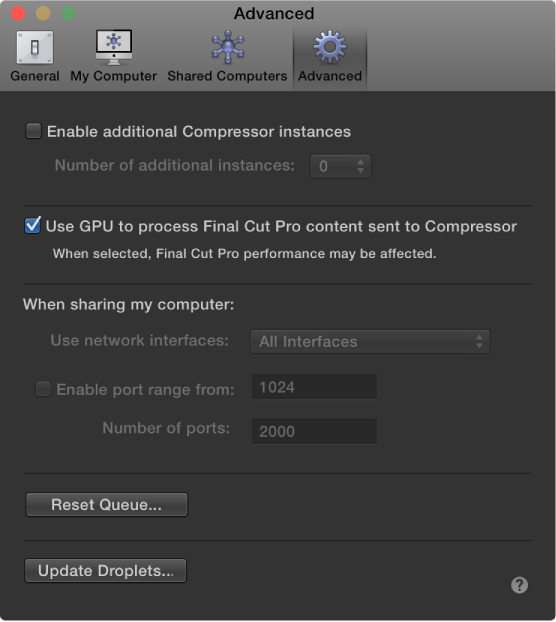 Use GPU to process Final Cut Pro content sent to Compressor: This checkbox instructs Compressor to use the computer’s graphics processing engine to display or transcode a Final Cut Pro X project sent to Compressor for processing. If you’re running both Compressor and Final Cut Pro at the same time, enabling this setting may degrade Final Cut Pro performance. For more information about transcoding Final Cut Pro projects, see Transcode Final Cut Pro and Motion projects using Compressor. Use network interfaces: When you’ve allowed others to share your computer, you can restrict distributed processing activity to the network interface that you specify in the pop-up menu. Enable Port Range: When you’ve allowed others to share your computer, you can select this checkbox to set the ports on which distributed processing is run. After selecting the checkbox, enter the number at which you want to start the port range and the number of ports you want the range to contain. Reset Queue: Click to reset the queue of Compressor jobs. After you click this button, you can choose to reset the queue and cancel all pending jobs, or reset the queue and then restart any pending jobs. Update Droplets: Click to update all droplets on the local computer to be compatible with the current version of Compressor. Outdated droplets that are not updated may not function properly. After droplets are updated, they’ll no longer work on computers using older versions of Compressor.